I love a good two-for-one deal. Especially when that deal involves peanut butter and chocolate. Sometimes it’s impossible to pick which one I want, and with these bars I don’t have to. There’s a peanut butter and white chocolate base that’s soft yet dense, rich, and creamy. 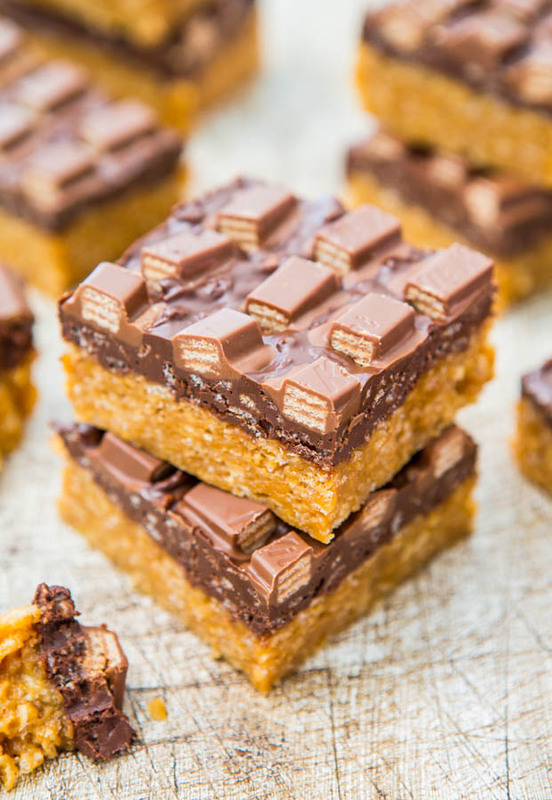 The top is a layer of chocolate-peanut butter fudge, and there’s Rice Krispies added for crispy texture. Both layers actually have Krispies in them, but it’s more pronounced in the top layer. The recipe for the chocolate layer I originally created to top some brownies that are in my first cookbook, Peanut Butter Comfort. They’re perhaps my favorite brownies ever, tied with these. Recently I was thumbing through my cookbook and remembered how much I loved the topping, and had to make it. But I didn’t want to turn on my oven and make brownies because San Diego was having a wicked, but typical, hot snap the last few weeks and my condo doesn’t have air so it was 92F inside. No ovens were turned on. 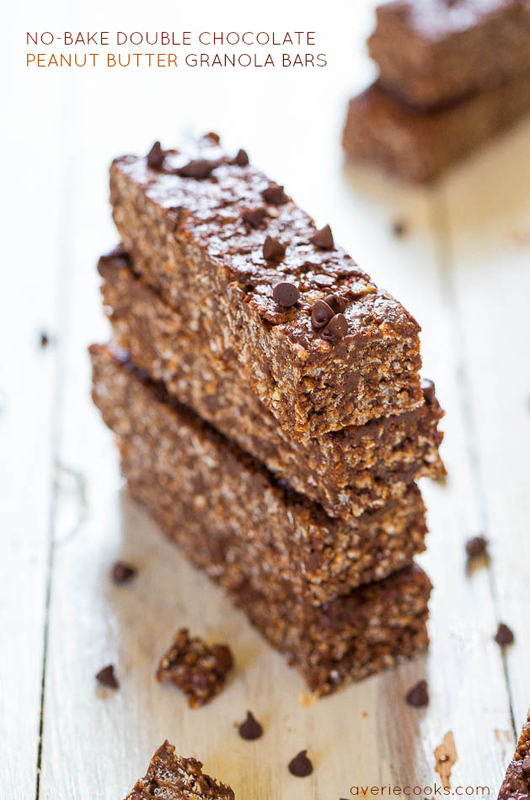 The beauty of these no-bake, one-bowl, gluten-free bars is that they’re fast, easy, and people will go nuts over them. 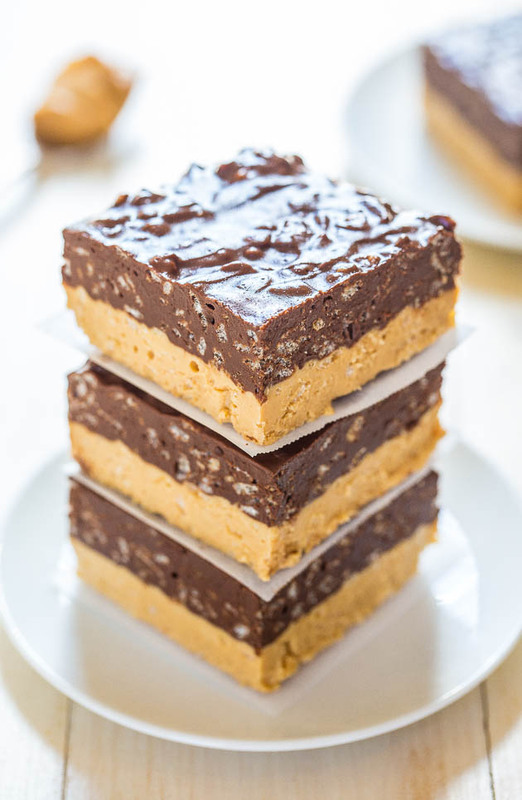 I mean who can resist two thick layers of peanut butter and chocolate-peanut butter fudge sandwiched together. I sure can’t. They’re also a great make-ahead dessert. 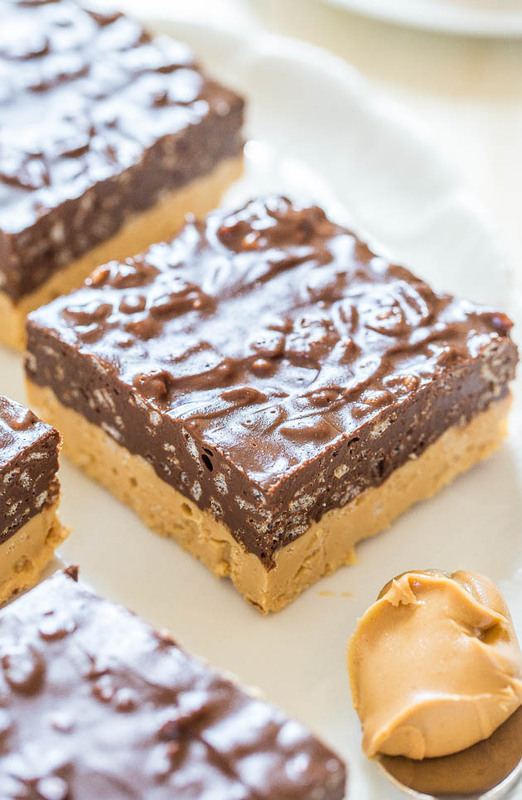 They’ll literally keep for weeks in your fridge or months in the freezer, which is both good and bad, knowing you’ve got chocolate peanut butter fudge waiting for you. But I see it as good. 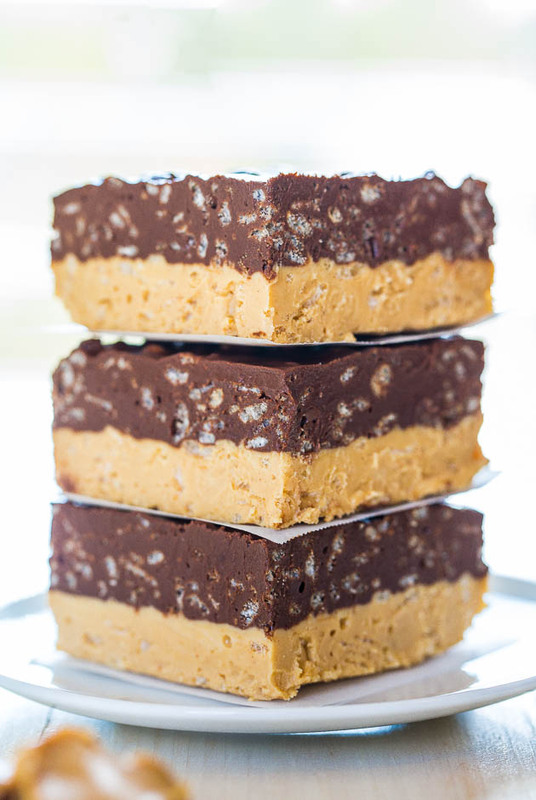 You don’t have to pick between a peanut butter or a chocolate dessert in these no-bake, one-bowl, gluten-free, fast, and easy bars. There’s a peanut butter and white chocolate base that’s soft yet dense, rich, and creamy. 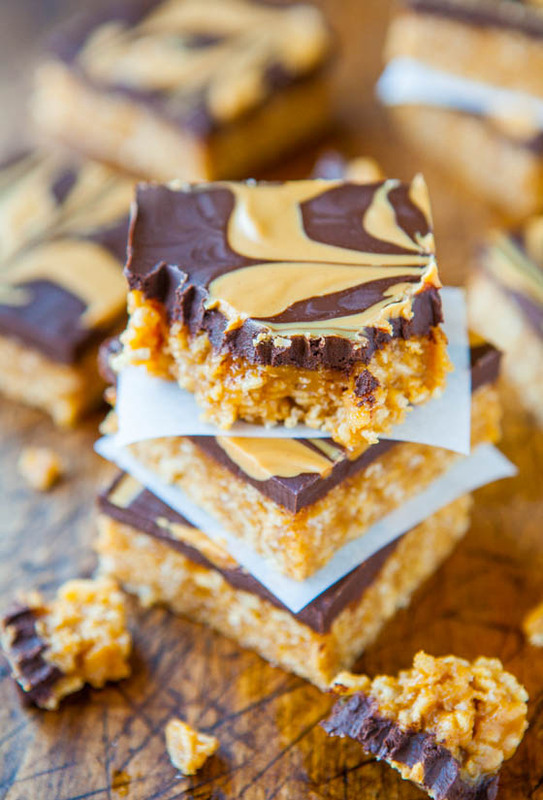 The top is a layer of chocolate-peanut butter fudge, and there’s Rice Krispies added for crispy texture. 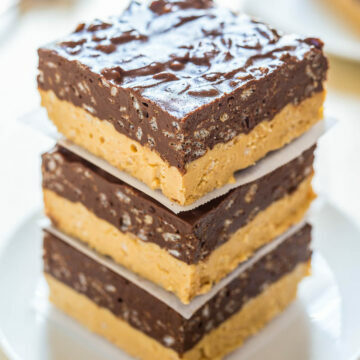 They’re a great make-ahead dessert and will keep for weeks in your fridge or months in the freezer, which is both good and bad, knowing you’ve got chocolate peanut butter fudge waiting. Peanut Butter Base – In a medium, microwave-safe bowl add the white chocolate chips and heat for 1 minute on high power to soften. Remove bowl from microwave, add 1 cup peanut butter (use Jif, Skippy, or similar because natural or homemade peanut butter could separate and may not set up well and/or the bars could turn very oily), and heat on high power to melt, about 1 minute or as necessary in your microwave; white chocolate scorches easily so keep a careful eye on it. Stir until mixture is smooth and combined. Add 1 cup crispy rice cereal and stir to combine. Turn mixture out in prepared pan in an even, flat layer, smoothing the top lightly with a spatula. Place pan in freezer to chill. Chocolate Fudge Top – In a medium, microwave-safe bowl (you can use the same one, just wipe out with a paper towel) add the semi-sweet chocolate chips and heat for 1 minute on high power to soften. Remove bowl from microwave, add 1 1/2 cups peanut butter, butter, and heat on high power to melt, about 1 minute. Stir until mixture is smooth and combined. Add 1 1/2 cups crisp rice cereal, and stir to combine. Remove pan from freezer (make sure the first layer has set up somewhat before adding the chocolate, if not, return pan to freezer for 5 more minutes) and carefully turn chocolate mixture out into prepared pan in an even, flat layer, smoothing the top lightly with a spatula. Place pan in freezer to chill. Allow bars to chill for 60 to 90 minutes, or until set, before serving. If bars have gotten too firm to slice, let them sit at room temp for 10 minutes. I store these bars in the fridge because they get a little too soft at room temp. Bars will keep airtight in the fridge for about 1 month and in the freezer for up to 6 months. 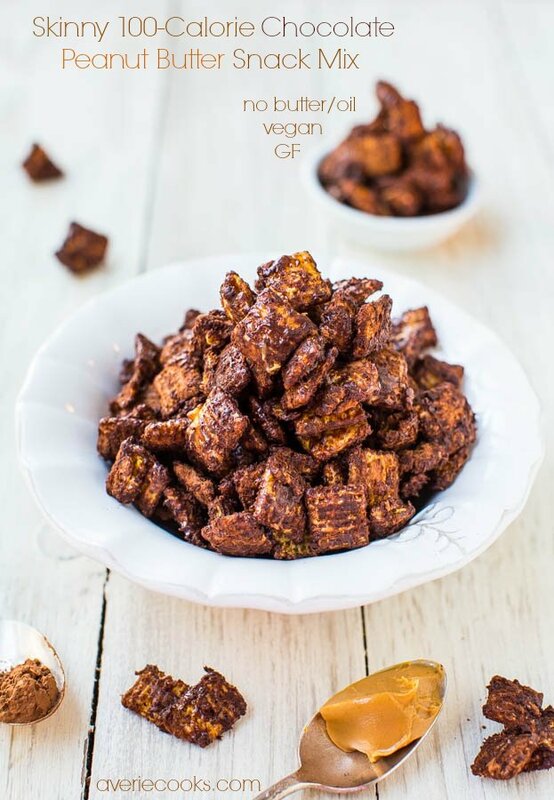 Skinny 100-Calorie Chocolate Peanut Butter Snack Mix (vegan, GF, no butter/oil) – 5 mins to make, satisfying, & won’t derail your diet! I love these!!! It’s great that they hold so long in the refrigerator/freezer, too! Mmm, I will never stop loving chocolate and peanut butter together!! 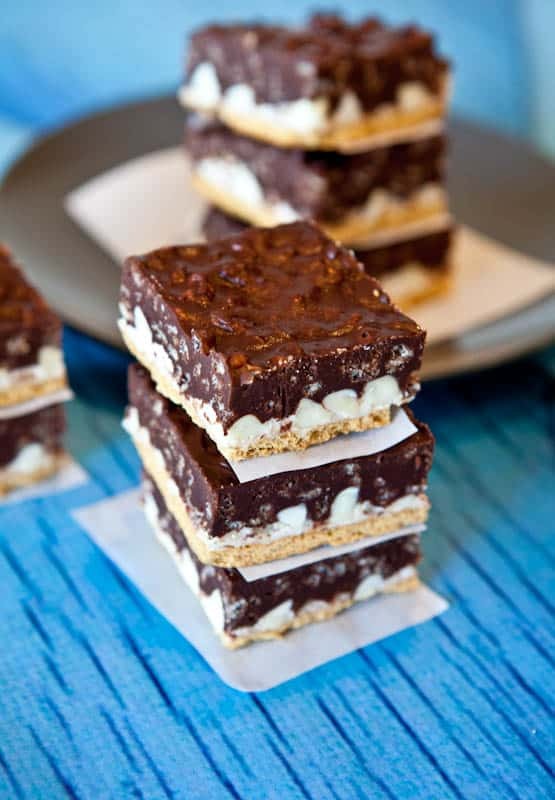 These bars look super duper delicious. Pinned! Yum! 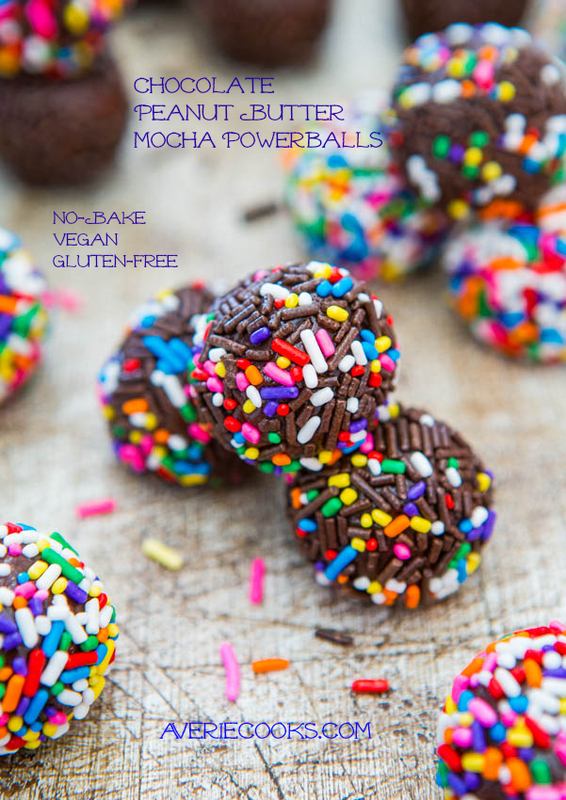 These would never last long in the fridge OR freeze for me… I’d eat them all too quickly! OMG ~ how much do I lOVE these bars. Pinned & sharing on FB too! Oooooooh! These are the perfect, perfect, perfect thing for me to make for our church potluck this weekend! Score. No one should ever have to choose between peanut butter and chocolate! These look AH MAZING Averie!! 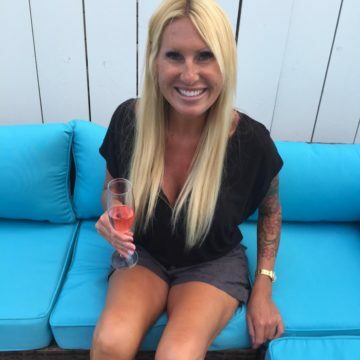 Good work lady! These look deeeeeelicious. I mean, you can’t go wrong with chocolate and peanut butter but then there’s a crunch? YASS! I am just drooling here looking at these peanut butter fudge bars! 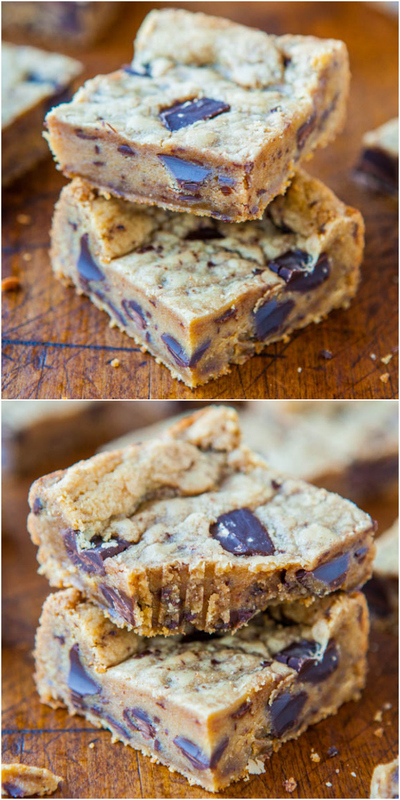 As a serious peanut butter lover these bars are definitely a must make recipe for me. Pinned! I love chocolate and you have shown in picture is chocolate lovers dream. Recipe without baking easier and better. Thanks! Definitely pinning this for a future sweet treat. 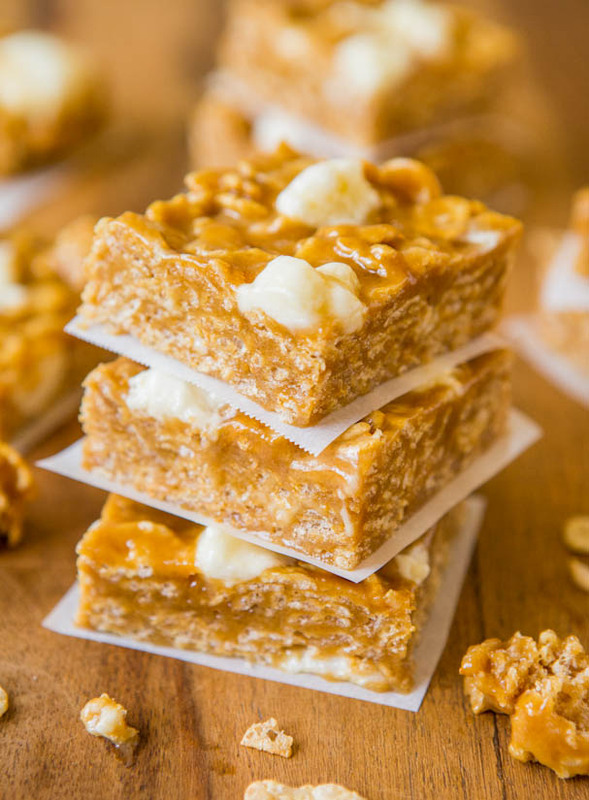 I love the white chocolate addition to the peanut butter – and of course the Rice Krispie element. I’m pretty basic when it comes to peanut butter and chocolate. One spoonful of peanut butter in one hand a piece of chocolate in the other, then eat a bite from each hand until gone – repeat. In so many ways, basic is good when it comes to the major food groups, you know, chocolate & PB! 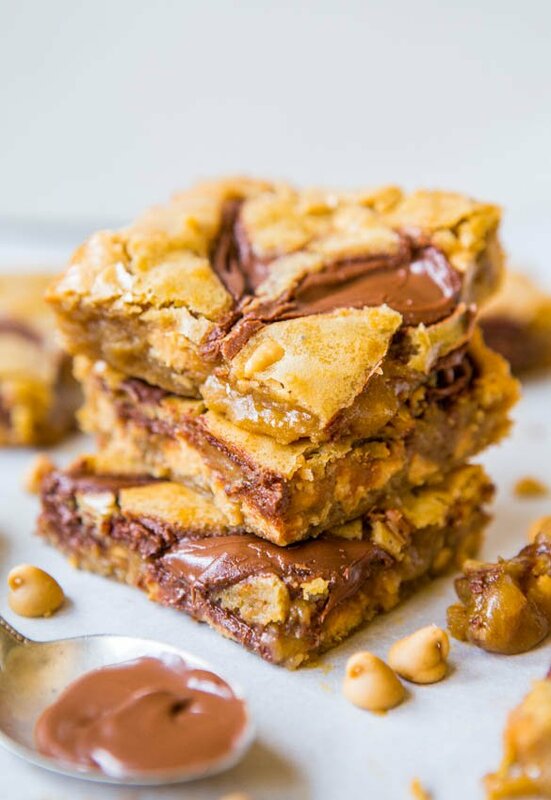 So I can totally relate to this “One spoonful of peanut butter in one hand a piece of chocolate in the other, then eat a bite from each hand until gone – repeat.” You will love these bars then! Just the basics so you can really just savor them! omiGOSHHHHHHHHH. So fudgy and rich and perfect! i could eat 10 of these!! I’m in the process of making these, the base is in the freezer right now. But when I melted the white chocolate, and then out of the peanut butter and put it back in the microwave for a minute like it says the white chocolate seized up, it seems like I was able to salvage it even though the mixture was still a bit lumpy. It seems like 2 minutes microwaving the white chocolate might have been overkill, thoughts? though now that I think about it, I didn’t stir the peanut butter into the white chocolate before microwaving for a second time, perhaps that was the problem. Either way hoping that they turn out because they look delicious. I didn’t stir the peanut butter into the white chocolate before microwaving for a second time, perhaps that was the problem = YES that was the problem because if you’re just heating the white choc by itself, with nothing to ‘buffer’ it, it could scorch/seize in 2 minutes, absolutely. With white chocolate, and microwaves, bowl types/sizes/materials, etc. it’s always best to start slowly (less is more!) with the heat and adjust as necessary to get things to melt in your own kitchen. Sounds like you’re on track though! SOOO good. Just made these today. I think they are more “candy” than “cookie bar” and cut them into 24 pieces. I didn’t have quite a full bag of white chocolate chips so I rounded it off with butterscotch chips and it didn’t hurt a thing. ;) (it couldn’t be because I have an addiction to white chocolate and broke into the bag … nah …). I think, though, that your heart is leading you away from cookies and desserts and more toward main dishes, judging from your recent posts. After 6 years of mostly sweets, I think me and my readers could use some ‘food’. 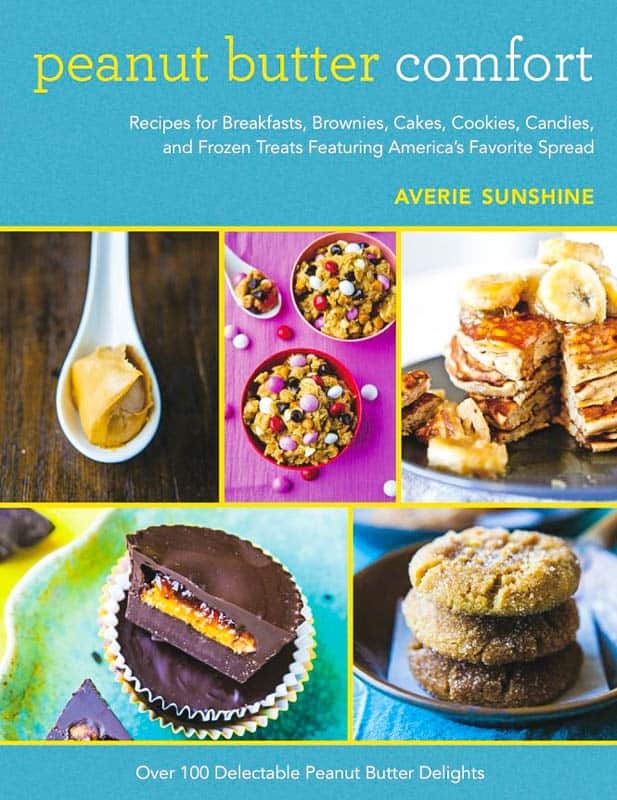 I love baking but my readers are telling me they love to ‘eat’, you know, like dinners so trying to mix in a hearty dose of real food amidst the sugar! These look utterly amazing! Is there a particular reason to not use natural peanut butter, though? Natural PB is oily, thinner, and can separate and isn’t my first choice for baking. Gotcha. Thanks for the reply. ? These sound so good and Id love to make them especially since its too hot to cook! Although, I cant stand white chocolate. Is there anything I could substitute it for that would complement the peanut butter layer? Not really but you really cannot taste it. It’s used as a binder and not for flavor. I think you’re safe! These look so good. I am wondering, if I need a bigger batch, could I double this in a 9×13? Doubling and baking in a 9×13 would probably be just fine. I understand that natural peanut butter won’t work, but am curious if PB2 could be subbed for the peanut butter. Certainly would be worth a try I think! Others have made it with both and with decent results I think if you read through some comments.